Yesterday afternoon Secretary of Energy (and my former professor) Ernie Moniz addressed a packed house at Columbia University’s new Center on Global Energy Policy. Moniz’s remarks demonstrated to me that (1) given the inaction of Congress, the Administration’s “Climate Action Plan” is about as comprehensive a “Plan B” as one can expect to reduce carbon pollution and prepare for the impacts of climate change; and (2) his combination of technical and political savvy are already making Moniz an extremely effective DOE head. Notes on the key points of Moniz’s talk are below. Hurricanes destroying (or forcing temporary closure of) oil and gas production and refining facilities around the Gulf of Mexico – a trend that has caused $8 billion in economic losses over the past few years. Droughts diminishing the supply of cooling water for thermoelectric power plants and flowing water for hydroelectric plants (hence causing plant shutdowns). To counter these growing threats to US infrastructure, Moniz described the Administration’s Climate Action Plan as including a “step change” improvement in adapting the built environment to better withstand the physical impacts of a warmer climate. To wit, prior to his talk Moniz had been in New Jersey signing a Memorandum of Understanding with Gov. Christie to build a micro-grid for New Jersey’s transit system that – in the event of a larger system will failure – will keep the trains and buses running. Impressively, Moniz described the proposed NJ Transit micro-grid as including 50 Megawatts (MW) of distributed generation technologies such as batteries and solar panels (50 MW being capable of powering roughly 16,000 homes). Moniz touted the New Jersey project as a harbinger of increased federal collaboration with states and localities to build smarter and more resilient infrastructure (or, as the Secretary put it, moving climate adaptation beyond “building sea walls”). Energy Efficiency (3 billion tons of “low-hanging fruit”) : Flush with Recovery Act dollars, Secretary Chu (Moniz’s predecessor at DOE) often began his speeches by detailing recent investments by ARPA-E, the Loan Guarantee Program Office, and other new DOE initiatives to fund clean energy innovation. Moniz praised those programs but – in a nod to leaner fiscal times – chose instead to emphasize DOE’s role in setting standards for the energy efficiency of buildings and appliances. For example, the Department will soon propose new, national standards for the energy efficiency of walk-in coolers and freezers, metal halide lamps, commercial refrigeration equipment, and electric motors. The American Council for an Energy-Efficient Economy projects that, by 2035, stricter standards for these appliances could reduce energy bills by $3.8 billion annually and CO2 emissions by 26 million metric tons annually. Obama energy policy NOT a “war on coal”: Critics in Congress and industry attack President Obama’s Climate Action Plan as a “war on coal.” As evidence critics point to EPA proposals to regulate greenhouse gas (GHG) pollution from new and existing power plants – the latter of which, they claim, will precipitate closure of 285 coal-fired plants in 32 states. Moniz deftly rejected the “war on coal” charge, noting that DOE”s Loan Guarantee Program has recently set aside $8 billion to support innovative fossil energy projects such as carbon capture and storage (CCS) systems. The risks of climate change demand action to move America toward a less carbon-intensive energy mix (hence the EPA regulations); at the same time, the Administration is supporting development of technologies that will enable all of America’s energy sources – including coal – to compete in a carbon-constrained marketplace. Though unlikely to mollify Obama’s most strident critics, Moniz’ explanation of the Administration’s energy policy is to me quite persuasive. Worse than coal? Probably not: Contrary to the findings of some researchers that gas from shale wells is over its life-cycle worse for the climate than coal, Moniz referenced newer findings that shale gas has not substantially changed the overall GHG intensity of natural gas production (i.e. that shale gas is still less GHG-intensive, hence better for the climate, than coal). While this topic is complex and justifies a longer post, Moniz’s emphasis on actual data – as opposed to blind assertions – is comforting. “Manageable” does not mean “being managed”: Some in industry dismiss environmental concerns about fracking by insisting that any issues are manageable through sound engineering. 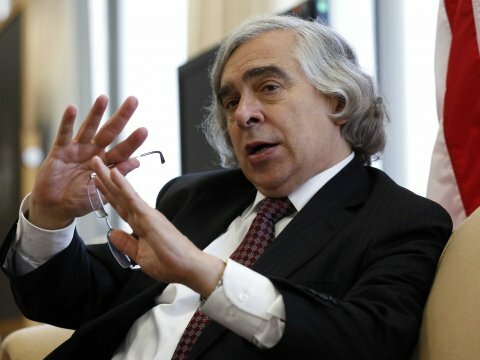 Moniz rightly noted, however, that a solution (i.e. sound well-casing) being available is different from a solution being implemented. He then stressed the importance of ensuring consistent application of best practices (though declined to offer or endorse any specific ideas on how to do this). Wait-and-see on nuclear: Echoing some of my points in last week’s post, Moniz articulated a “wait-and-see” approach toward investment in new US nuclear reactors. The most pressing issue is for the four new reactors being constructed in Georgia and South Carolina to reach completion on-time and on-budget (which, at this early stage, still looks feasible). A second issue is to implement a new long-term solution for storing nuclear waste (a topic on which Moniz has helped to formulate recommendations). Progress on both those fronts (and, I’ll add, higher natural gas prices) seem prerequisite for any significant, sustained investment in new nuclear power plants. Overall a very encouraging afternoon. With any luck Moniz will return to NYC a few years from now to share DOE’s many accomplishments under his leadership. Addendum for the wonks among you (energy efficiency and the Social Cost of Carbon): Moniz reported increased DOE engagement with OMB’s Office of Information and Regulatory Analysis (OIRA) to expedite approval of new energy efficiency standards. Encouragingly, he noted that – in calculating the costs and benefits of proposed regulations – OIRA has begun to use a revised Social Cost of Carbon estimate of $36/ton. The new higher figure reflects, in part, more explicit representation of economic damages due to sea level rise. May better accounting for the costs of carbon pollution enable pollution-reduction policies such as energy efficiency standards to pass regulatory scrutiny more quickly!